I'm still keeping up with Mabel Figworthy's Fancies Song of the Weather SAL, even if I'm miles behind with the Skill Builder BOM and I'm running out of May for May's block in the And Sew On BOM. This is May. I loved stitching this, there's something so soothing and relaxing about Kloster blocks and the cut work. The needleweaving on the bars was the Uneven Weave, a new one for me but not hard. The fan stitch (the dark blue in between the needlewoven bars) was also new for me and my first attempt wasn't tight enough, so out it came. This was another octagon block, so I added the corner fans and klosters to make it square, as I did with February's block. Here they all are together. Just June to go and I'll be adding "sashing" between the blocks and turning it into a hanging. I can't get any decent photos of this work at all, my camera sees white and turns it blue! Beautiful nwk ! Re blue whites - is the camera set for tungsten light ? How do you do the openings? 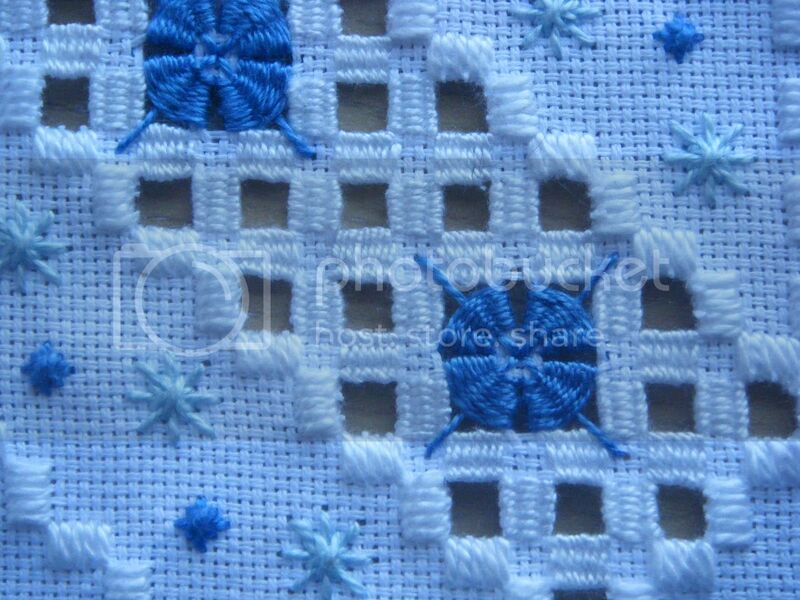 really lovely, such tiny neat stitches. I love seeing the progress on your hardanger. Each block is so pretty and the finished piece will be stunning. Pretty blue, haha! You're in the home stretch - that wall hanging will be gorgeous when you get the June block done and get it all stitched up! Looks great. Will be an awesome hanging. 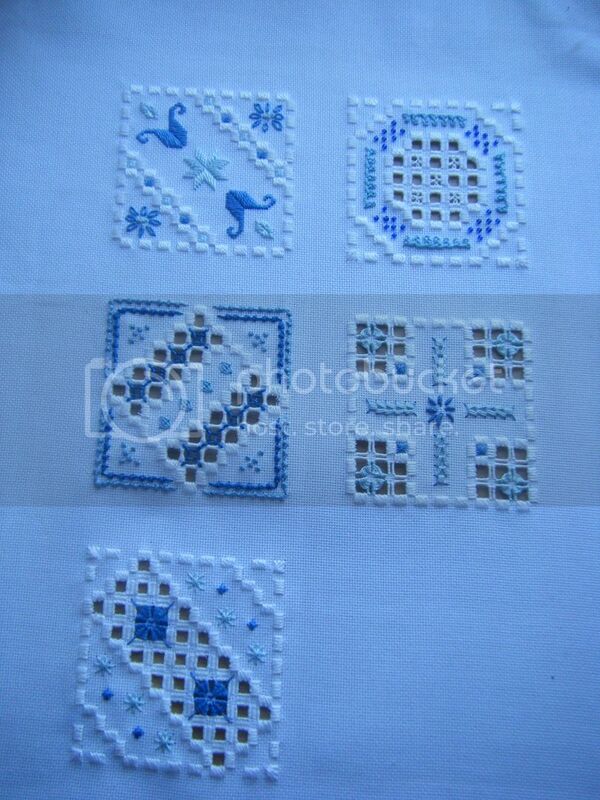 Another great block, these are making me think of digging out some Hardanger patterns! 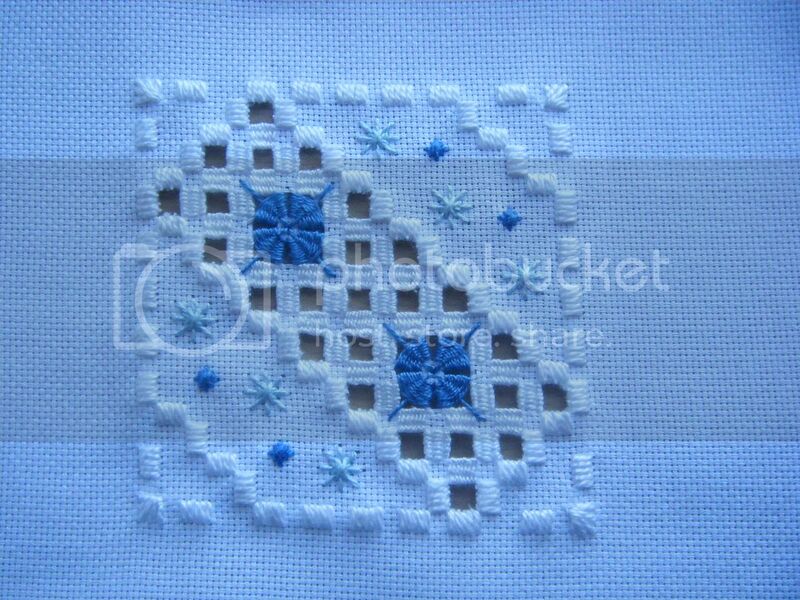 Beautiful, your stitches are so neat and precise, it is a work of art and will make a stunning hanging.